Now the Mac authentication function is no problem, but when the server requires the user to take Portal authentication, it does not take effect. If the device is configured with mac authentication, no matter which authentication method AAA decides, our device will first perform mac authentication request. Through this filter id , I understand that you want to let users cut the domain before going online, and then go through the Portal authentication process, but they are back to accept, our device thinks that mac authentication is successful, it will not go online. The behavior of our device is fixed, mainly depends on how the AAA server responds to the Mac authentication request. MAC address authentication controls network access permissions of a user based on the access interface and MAC address of the user. The user does not need to install any client software. The user name and password are the MAC address of the user device. 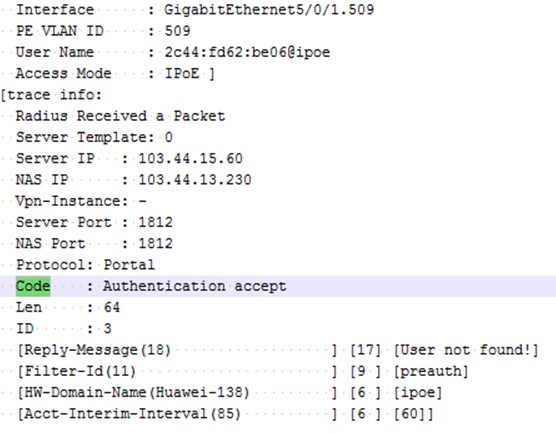 After detecting the MAC address of a user for the first time, a network device starts authenticating the user. This post was last edited by No.9527 at 2018-10-31 15:01.
what's more can you share the details commonds how to configure this? thanks very much! This post was last edited by Torrent at 2018-10-22 13:44.
when me read this case, i think it is very useful for us, but maybe it nned to decribe more detail. This post was last edited by yjhd at 2018-10-31 17:19. This post was last edited by GongXiaochuan at 2018-10-30 13:32. I have required a lot of knowledge，which enquires me to gohead for excellent level . This is a rare sticker that has been rare for a hundred years! Heaven has eyes, let me see such a wonderful post in the eugenic year. Thanks for your sharing ,In MAC address-prioritized Portal authentication, when the Portal server needs to authenticate a user terminal, the device first sends the user terminal's MAC address to the Portal server for identity authentication. If the authentication fails, the Portal server pushes the Portal authentication page to the terminal. The user then enters the user name and password for authentication. The RADIUS server caches a terminal's MAC address and associated SSID during the first authentication for the terminal. If the terminal is disconnected and then connected to the network within the MAC address validity period, the RADIUS server searches for the SSID and MAC address of the terminal in the cache to authenticate the terminal. thank you , but i have a question , how to choose which kind of authentication when we have multiple authentication ? This post was last edited by Finn92 at 2018-10-31 16:40. MAC address authentication controls network access permissions of a user based on the access interface and MAC address of the user. The user does not need to install any client software. The user name and password are the MAC address of the user device. After detecting the MAC address of a user for the first time, a network device starts authenticating the user. This post was last edited by No.9527 at 2018-10-31 15:02.